Fantastic Beasts and Where to Find Them is a 2016 fantasy film directed by David Yates and distributed by Warner Bros. Pictures. A prequel of the Harry Potter film series, the film was produced and written by J. K. Rowling, in her screenwriting debut, and inspired by her book of the same name. The film stars Eddie Redmayne as Newt Scamander with Katherine Waterston, Dan Fogler, Alison Sudol, Ezra Miller, Samantha Morton, Jon Voight, Carmen Ejogo, Ron Perlman and Colin Farrell in supporting roles. It is the first instalment in the Fantastic Beasts series, and the ninth overall in J. K. Rowling's Wizarding World. Principal photography began at Warner Bros. Studios, Leavesden on 17 August 2015. 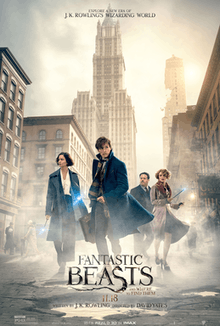 Fantastic Beasts and Where to Find Them premiered in New York City on 10 November 2016 and was released worldwide on 18 November 2016 in 3D, IMAX 4K Laser and other large format theatres. It received generally positive reviews from critics and has grossed $609 million worldwide. In 1926, British wizard Newt Scamander arrives by boat to New York City en route to Arizona. He encounters Mary Lou Barebone, a non-magical woman ("No-Maj" or "muggle") who heads the New Salem Philanthropic Society, which claims that witches and wizards are real and dangerous. As Newt listens to her speak, a Niffler escapes from his magically-expanded suitcase, which houses multiple magical creatures. As he attempts to capture it, he meets No-Maj cannery worker and aspiring baker Jacob Kowalski and they accidentally swap suitcases. Demoted Auror Tina Goldstein arrests Newt for being an unregistered wizard and takes him to the Magical Congress of the United States of America (MACUSA) headquarters, hoping to regain her former position. However, President Seraphina Picquery and Director of the Magical Security Percival Graves dismiss the case. At Jacob's apartment, several creatures escape from Newt's suitcase. Graves approaches Credence Barebone, Mary Lou's adopted son, and offers to free him from his abusive mother in exchange for his finding the host of an Obscurus, a dark, destructive force inadvertently manifested by young magical children forced to conceal their powers. The force can be unleashed during periods of anger and stress; Graves believes that it has caused several mysterious destructive incidents around the city. After Tina and Newt find Jacob and the suitcase, Tina takes them to her apartment and introduces them to Queenie, her Legilimens sister. Queenie and Jacob are mutually attracted, though American wizards are forbidden to marry No-Majs or interact with them. Newt takes Jacob inside his magically-expanded suitcase, where Jacob encounters a contained Obscurus that Newt recently extracted from a girl who died. Newt persuades Jacob to help search for the missing creatures. After re-capturing two of the three escaped beasts, they re-enter the suitcase, which Tina takes to MACUSA. Officials arrest them, believing one of Newt's beasts to be responsible for killing Senator Henry Shaw Jr., and decide to destroy Newt's suitcase and obliviate Jacob's memory. Graves interrogates Newt and Tina and accuses Newt of conspiring with the infamous dark wizard Gellert Grindelwald. Newt and Tina are immediately sentenced to death, but they escape and meet up with Queenie and Jacob; the foursome then capture the last of the creatures after receiving a tip from the goblin gangster Gnarlack. Credence finds a wand under his adopted sister Modesty's bed. Mary Lou assumes the wand is Credence's, but Modesty claims it is hers. When she is about to be punished, the Obscurus is unleashed, killing everyone except Modesty and Credence. Graves arrives and dismisses Credence as being a Squib (a non-magical person of wizard ancestry), and refuses to tutor him in magic after they enter Modesty's biological family's home. Credence then reveals himself as the host of the Obscurus, the real cause of Shaw's death, and unleashes it upon the city in a rage. In a subway tunnel, Newt talks to Credence but is attacked by Graves. Tina, who knows Credence, arrives and attempts to calm him, while Graves tries to convince Credence to listen to him instead. As Credence begins to settle into human form, Picquery arrives with Aurors and decides Credence's life must be forfeited to keep the existence of magic hidden. The Aurors apparently disintegrate him, but Newt notices a tiny wisp of the Obscurus fleeing. Graves admits to unleashing the Obscurus to expose the magical community to the No-Majs, and angrily claims that MACUSA protects the No-Majs more than themselves. He repels the Aurors but is subdued by one of Newt's beasts and revealed to be Gellert Grindelwald in disguise. Grindelwald is then taken into custody by MACUSA Aurors. MACUSA fears it is too late to protect their secret world, but Newt releases his Thunderbird to disperse a potion over the city via a downpour that will erase all New Yorkers' recent memories. MACUSA wizards repair the destruction, and Jacob reluctantly agrees to let himself be obliviated as well. Queenie kisses Jacob goodbye as the rain erases his memories. Newt departs for Europe, but promises to return and visit Tina once he finishes his book; he also anonymously leaves Jacob a case of Occamy eggshells (made of silver), allowing Jacob to fulfil his dream of opening his own bakery. His breads and pastries are unknowingly inspired by Newt's creatures, and Queenie visits him in his shop. Katherine Waterston as Porpentina "Tina" Goldstein: a grounded, down-to-earth witch and a former Auror employed by the Magical Congress of the United States of America (MACUSA). She longs to fight for what is right, but was demoted to a position well below her skill level. Alison Sudol as Queenie Goldstein: Porpentina's younger sister and roommate, described as a bombshell, free-spirited, and big-hearted, and is accomplished in Legilimency. Ezra Miller as Credence Barebone: Mary Lou's troubled and mysterious adopted son. Samantha Morton as Mary Lou Barebone: a narrow-minded No-Maj and the sinister leader of the New Salem Philanthropic Society (the NSPS, or "The Second-Salemers"), an extremist group whose goals include exposing and killing wizards and witches. Faith Wood-Blagrove as Modesty Barebone: a haunted young girl and the youngest of Mary Lou's adopted children. Zoë Kravitz as Leta Lestrange: Newt's former love while the two attended Hogwarts. Leta betrayed his trust, leaving him bitter, but he still carries her picture. Eddie Redmayne was cast in the lead role of Newt Scamander, the Wizarding World's pre-eminent magizoologist, in June 2015. Matt Smith and Nicholas Hoult were also considered. Alison Sudol, in her feature film debut, and Katherine Waterston were subsequently chosen to play the witch sisters Queenie and Tina. Ezra Miller and Colin Farrell joined the cast as the wizards Credence and Graves, while comedian Dan Fogler was cast as Jacob, a non-magical person whom Newt befriends. Following thousands of auditions in an open casting call, ten-year-old Faith Wood-Blagrove was chosen for the part of Modesty. Jenn Murray signed on to star as Chastity, and Samantha Morton was cast as Mary Lou. Jon Voight, Gemma Chan, Carmen Ejogo and Ron Perlman were cast in unnamed roles. Michael Gambon, who played Albus Dumbledore in six of the eight Harry Potter films, was desperate to appear in the spin-off. Principal photography on the film commenced on 17 August 2015, at Warner Bros. Studios, Leavesden. Several scenes were also shot on location in London. After two months, the production moved to St George's Hall in Liverpool, which was transformed into 1920s New York City. Framestore in London produced the visual effects for the film. On 9 April 2016, it was announced that James Newton Howard would write and compose the film's score. On 24 October, Pottermore published an official first look at the film's main theme composed by Howard. The main theme incorporated John Williams' themes from earlier films, such as Hedwig's Theme. The soundtrack was released by WaterTower Music on 18 November 2016. Fantastic Beasts and Where to Find Them held its world premiere at Alice Tully Hall in New York City on 10 November 2016. The film was released worldwide on 18 November 2016, in 2D, 3D and the new IMAX 4K Laser system. It would premiere one day earlier in a number of other countries, including Argentina, Australia, Brazil, Germany and Italy, on 17 November. The film will be released in a total of 1,028 IMAX screens worldwide (388 screens in the United States and Canada, 347 screens in China, 26 screens in Japan and 267 screens in other countries). This marked the second time – after Doctor Strange – that a film secured a release in over 1,000 IMAX screens worldwide. On 4 November 2015, Entertainment Weekly released the first official publicity shots of the film, containing pictures of characters Newt, Tina, and Queenie, and production and filming being held in various sets designed to mirror 1920's New York City. On 10 December 2015, it was announced that an "announcement trailer" would be released five days later, on 15 December. Along with the one-minute trailer, a teaser poster was released. During "A Celebration of Harry Potter" at Universal Orlando Resort in February 2016, a featurette was released showcasing several interviews with various cast and crew members, as well as the first official behind-the-scenes footage. Rowling has also released four pieces of writing exclusively as an introduction to Fantastic Beasts and Where to Find Them, titled History of Magic in North America. It includes information about scourers, brutal and violent magical mercenaries who played a big role in the historic Salem witch trials of the 1600s, as well as info about various American wand makers, the role magic played in World War One, Native American magic, the foundation of MACUSA, the way No-Maj/Wizarding segregation was enforced brutally after a violent and terrifying breach of the international statute of secrecy and the institution of Rappaports Law, and life in 1920's Wizarding America, with info about Wand Permits and Prohibition. On 10 April 2016, the first "teaser trailer" was released during the MTV Movie Awards. On 26 April 2016, it was announced that the film's script will be released in the form of a book on 19 November. More visual publicity for the film was released at CineEurope and VidCon on 23 June. A new featurette entitled "A New Hero" was released later in the day, and a well received test screening was held in Chicago at the end of July, with viewers praising the complex plot line, the emotion, and the darkness at the heart of the story. A third Art-Deco/German Expressionist-style poster was revealed at Comic-Con. Interactive wand stations have appeared at both VidCon and Comic-Con conventions. A new trailer for the film was unveiled at Warner Bros.' Comic-Con Hall H panel shortly after an interview with members of the cast. A quick-to-sell-out signing took place shortly thereafter. Rowling released a second part to her History of Magic in North America series, entitled "Ilvermorny School of Witchcraft and Wizardry," which details the founding of the preeminent American Wizarding academy and allows users to sort themselves into one of the four houses of the school. The school is mentioned in the film. On 10 August, more information and publicity shots for the film were released through Entertainment Weekly, with new information on Ezra Miller's character Credence Barebone and the news that Zoe Kravitz would have a role in the series. New images released include the quartet running down a New York City alleyway, David Yates chatting to stars Katherine Waterston and Eddie Redmayne on the set in front of a blown out Subway station, Colin Farrell's character Percival Graves interrogating an arrested and handcuffed Newt, and Graves and Credence putting up anti-magic propaganda. Beginning in the month of September, more news was released on the various tie-in books being released for the film. On 28 September, the final trailer for the film officially premiered via EllenTube, quickly becoming the most viewed film trailer of the year to date. Not long after, an announcement was made that a global fan event would be held in London and Los Angeles, as well as a number of other cities worldwide, on 13 October. A live Q&A was held and more new footage from the film was revealed. Visitors were treated to the first seven minutes of the film and were also invited to stay for the first film of the Harry Potter franchise in IMAX, the start of a marketing push that saw all 8 films return to IMAX theatres internationally for one week leading up to the release of Fantastic Beasts. Due to demand, the fan event was expanded to a number of other US and international locations. As of 4 December 2016, Fantastic Beasts and Where to Find Them has grossed $183.5 million in the USA and Canada and $424.4 million in other countries, for a worldwide total of $607.9 million. The film was made on a budget of $180 million, with an additional $150 million spent on marketing. Its box office prospects (the first film as well as the remaining four) have been compared to that of The Hobbit trilogy (especially the first instalment), a spin-off of The Lord of the Rings film series and Maleficent. Warner Bros. also used Doctor Strange as comparison in some markets given its similar release timeframe. Worldwide, the film grossed $219.9 million during its opening weekend from around 64 markets in 24,200 screens, both the fifth biggest in Rowling's wizarding cinematic universe and the fifth-biggest of the year and the seventh-biggest of the month of November. IMAX totalled $15 million from 605 screens. Fantastic Beasts went on general release in the United Kingdom and Ireland on 18 November 2016. It debuted with £15.33 million ($19.15 million) from 666 cinemas, the biggest debut of any film this year, ahead of the two previous record holders, Captain America: Civil War (£14.47 million) and Batman v Superman: Dawn of Justice (£14.62 million) and also the biggest opening market for the film. The film benefited largely from sold out multiplexes, with Warners reporting that the film occupied about 1,900 screens within those 666 venues. Compared to the Harry Potter films, its debut is significantly down on most, although previews complicate comparisons. Minus previews, Fantastic Beasts posted the third best opening, behind only Deathly Hallows – Part 1 (£18.32 million) and Part 2 (£23.77 million), unadjusted for ticket price inflation. In the United States and Canada, tracking had the film grossing $68–85 million in its opening weekend, with some estimates going as high as $100 million. The film was released on 18 November in 4,143 cinemas, of which 388 were IMAX screens, and over 3,600 were showing the film in 3D. It grossed $29.7 million on its first day, the second-lowest opening day among Rowling's adaptations (behind the $29.6 million Friday of Harry Potter and the Chamber of Secrets). This included $8.75 million it earned from Thursday night preview screenings beginning at 6 pm in 3,700 cinemas, which was well below the midnight preview grosses for the last few Harry Potter sequels. In total, the film earned $74.4 million in its opening weekend, falling in line with projections and finishing first at the box office, but recorded the lowest opening among Rowling's Harry Potter universe. In IMAX plays, it made $8 million from 388 IMAX screens, the third best debut for a Rowling title in the format after Deathly Hallows – Part 1 and Part 2. Around $9 million, equivalent to 12% of the weekend gross came from 500 premium large format locations. And finally, in Cinemark XD, it earned an estimated $1.75 million or 20% of the total PLF gross. The film's opening was considered a hit taking into account how it was not based on a popular existing source unlike the Harry Potter franchise and the film itself was void of the main character, Harry Potter. It was the top choice among moviegoers, representing 47% of the weekend's total $157.6 million tickets sales. Following its robust opening weekend, the film earned $6.76 million on its first Monday buoyed by 32% K-12 schools off, and 13% colleges being on break according to ComScore, lifting its four-day total to $81.2 million. The Monday gross was a drop of 63.4% from its $18.49 million Sunday gross which is quite normal even for a tentpole film since it's no longer a weekend. It earned more on its first Monday than the first two Harry Potter movies despite those films opening with over/under $90 million debut weekends. On Tuesday, it rose to $9.3 million, an increase of 38% – the biggest jump in Rowling's cinematic universe in terms of percentage. It passed the $100 million mark in six days. On its second Friday, it witnessed a gradual drop of 37% ($18.5 million) from last Friday, the second best Friday drop for any Harry Potter film, behind The Sorcerer's Stone. This was in part due to Black Friday, the most lucrative day of the Thanksgiving Day stretch. It ended up grossing $45.1 million in its second weekend (a drop of just 39.4%), finishing 2nd at the box office. Outside North America, the film debuted day-and-date in 63 countries, along with its North American release, where it was projected to gross $90–125 million in its opening weekend. It opened 16 November 2016, in 9 countries, earning $6.9 million from 5,070 screens. It opened in 38 more countries on 18 November, earning $16.6 million for a total of $23.5 million in two days. In three days, it made $53.6 million. Through Sunday, 20 November, the film had a five-day opening weekend of $145.5 million from 63 countries, which is way above the initial projections and ahead of the debuts of Maleficent, The Jungle Book and each of the three instalments in The Hobbit trilogy. However, a direct comparison is not possible as the number of markets varied between all films with Fantastic Beasts securing the most territories. It earned another $132 million in its second weekend after a robust debut in China and Japan. It recorded the biggest opening day of all-time among the Harry Potter franchise in Korea ($1.7 million), the UAE ($429,000) and Ukraine, the second biggest in Mexico ($1.8 million), Russia and the CIS ($1.7 million), Brazil ($1.3 million) and in Indonesia ($480,000), all behind Harry Potter and the Deathly Hallows – Part 2 and the third biggest in the United Kingdom ($5.4 million), behind Part 1 and Part 2. It also scored the second biggest Warner Bros. opening of all-time in the Czech Republic and Slovakia. Notably, France opened with $1.8 million, Australia with $1.6 million, Spain with $1.4 million, and Germany with $1 million ($2 million including paid previews). In terms of opening weekend, the film posted the biggest opening among the Harry Potter franchise in 16 markets, including South Korea ($14.2 million, also the third-biggest opening for the studio), Russia ($9.8 million) and Brazil ($6.4 million), the biggest opener of the year in Germany ($10.2 million), Sweden, Belgium and Switzerland and the biggest Warner Bros. debut in those along with France ($10.2 million), Holland and Denmark. Italy debuted with $6.6 million, the biggest for a U.S. film in the country. In other markets – where it didn't necessarily set records – Australia opened with $7.4 million, followed by Mexico ($5.8 million) and Spain ($4.5 million). South Korea's opening was worth $14.2 million from 1.94 million admissions between Wednesday and Sunday and accounted for 68% of the total weekend box office. It opened in China on November 25 alongside Disney's animated Moana but didn't face significant competition from it. It earned $11.2 million on its opening day from 11,600 screens (per Warner Bros.), the best among the Rowlings cinematic universe. In total, it delivered an opening weekend of $41.1 million (per Warner Bros.) and $39.1 million (per Entgroup), dominating 60% of the top five films with 70,000 screenings per day. This alone surpassed the entire lifetime total of all Harry Potter films save the last one. Similarly in Japan – typically the biggest or second biggest market for the previous Harry Potter instalments – it debuted with $15.5 million, besting the total lifetime of all the previous films except for Harry Potter and the Half-Blood Prince and Deathly Hallows – Part 2. The film also set quite a number of IMAX records in numerous markets. In total, the opening weekend was worth $7 million from 276 screens, which is the second-highest ever in the Wizarding World, behind Deathly Hallows – Part 2. In 33 territories, it opened at number one. Moreover, it's also the third highest-grossing November international IMAX opening ever, and the No. 1 start for IMAX in November in 19 countries including Japan ($1.1 million), the UK, Russia, Germany, and the Netherlands. In China, it had the biggest IMAX opening among the franchise with $5.1 million from 347 IMAX screens. Overall, the film has earned a global cumulative total of $19.1 million from the format. It has become the highest-grossing film in Rowling's cinematic universe in Russia ($16.7 million) and the second-highest in South Korea ($24.6 million). China ($41.1 million) the United Kingdom ($37.6 million), followed by Germany ($18.4 million), and France ($16.7 million) are the film's biggest earning markets. Fantastic Beasts and Where to Find Them received generally positive reviews from critics. On Rotten Tomatoes, the film has an approval rating of 75% based on 240 reviews, with an average rating 6.8/10. The site's consensus states that the film "draws on Harry Potter's rich mythology to deliver a spinoff that dazzles with franchise-building magic all its own". On Metacritic, which assigns a normalised rating to reviews, the film has a score 66 out of 100, based on reviews from 50 critics, indicating "generally favorable reviews". Audiences surveyed by CinemaScore gave the film an average grade of "A" on an A+ to F scale, the sixth film in the Harry Potter universe to receive such a grade. Peter Bradshaw of The Guardian gave the film five out of five stars, hailing it as "a rich, baroque, intricately detailed entertainment" and a "terrifically good-natured, unpretentious and irresistibly buoyant film." IndieWire's Eric Kohn gave the film a B+ saying that it "delivers the most satisfying period fantasy since Tim Burton's Sweeney Todd: The Demon Barber of Fleet Street," and that its layers of sophistication made it one of the best Hollywood blockbusters of the year. Mike Ryan of Uproxx gave the film a positive review, writing, "Newt Scamander is nothing like Harry, but it has to be this way. It all has to be different. And it is, but, again, with just enough 'sameness' to make us feel like we are at home again. I'm looking forward to wherever these movies are taking us." John DeFore of The Hollywood Reporter wrote that the film is "likely to draw in just about everyone who followed the Potter series and to please most of them." Initially, in October 2014, the studio announced the film would be the start of a trilogy. The second instalment is set to be released on 16 November 2018, followed by the third on 20 November 2020. In July 2016, David Yates confirmed that Rowling had written the screenplay for the second film and has ideas for the third. However, in October 2016 Rowling confirmed that the series would comprise five films. In November 2016, it was announced that Johnny Depp was cast to co-star in an undisclosed role, and was revealed to have a cameo in the first film. A week later, he was confirmed to be playing Gellert Grindelwald, and will have a starring role in the sequel. The second film will take place in the UK and Paris. ↑ "Fantastic Beasts and Where to Find Them (12A)". British Board of Film Classification. 28 October 2016. Retrieved 28 October 2016. ↑ Newman, Kim (18 November 2016). "Fantastic Beasts and Where to Find Them review: a fiddly start for J.K. Rowling's wizarding prequels". British Film Institute. Retrieved 29 November 2016. ↑ "Fantastic Beasts and Where To Find Them". British Council. Retrieved 1 December 2016. 1 2 Barnes, Brooks (7 November 2016). "Warner Bros., Quietly Thriving, Recasts Its Own Story". The New York Times. Archived from the original on 12 November 2016. Retrieved 11 November 2016. 1 2 "Fantastic Beasts and Where to Find Them (2016)". Box Office Mojo. Retrieved 4 December 2016. 1 2 3 McMillan, Graeme (1 June 2015). "Eddie Redmayne Officially Cast in 'Harry Potter' Prequel 'Fantastic Beasts and Where to Find Them'". The Hollywood Reporter. Retrieved 2 June 2015. 1 2 Kroll, Justin (15 June 2015). "'Fantastic Beasts': Katherine Waterston Lands Female Lead in 'Harry Potter' Spinoff". Variety. Retrieved 16 June 2015. ↑ "Pottermore - Everything we've learned about 'Fantastic Beasts'". Pottermore. Retrieved 29 November 2015. ↑ J.K. Rowling [jk_rowling] (15 August 2015). "Well, I think it's widely known that that characters of (Porpen)tina and Queenie are sisters, but not that their surname is Goldstein." (Tweet). Retrieved 17 August 2015 – via Twitter. 1 2 Kroll, Justin (9 July 2015). "'Fantastic Beasts': Alison Sudol Joins Eddie Redmayne in 'Harry Potter' Spinoff (Exclusive)". Variety. Retrieved 9 July 2015. 1 2 Ford, Rebecca (5 August 2015). "Colin Farrell Joins Harry Potter Spinoff 'Fantastic Beasts' (Exclusive)". The Hollywood Reporter. Retrieved 5 August 2015. 1 2 3 Osorio, Paulette (17 August 2015). "Filming Gets Underway on 'Fantastic Beasts and Where to Find Them'" (Press release). Warner Bros. Pictures. Business Wire. 1 2 Fleming Jr, Mike (10 July 2015). "Dan Fogler Cast In 'Fantastic Beasts And Where To Find Them' As Jacob: Comic Con". Deadline.com. Retrieved 11 July 2015. 1 2 Kroll, Justin (24 June 2015). "Ezra Miller Eyes 'Harry Potter' Spinoff 'Fantastic Beasts' (Exclusive)". Variety. Retrieved 25 June 2015. 1 2 3 "David Yates-Helmed 'Fantastic Beast' Filming Starts Up". Deadline.com. 17 August 2015. Retrieved 17 August 2015. 1 2 Kit, Borys (8 October 2015). "Harry Potter Spinoff 'Fantastic Beasts' Casts Ron Perlman (Exclusive)". The Hollywood Reporter. Retrieved 9 October 2015. 1 2 Kit, Borys (5 October 2015). "'Harry Potter' Spinoff 'Fantastic Beasts' Casts Jon Voight (Exclusive)". The Hollywood Reporter. Retrieved 5 October 2015. 1 2 "Fantastic Beasts actress chosen from open auditions". BBC. 5 August 2015. Retrieved 7 August 2015. 1 2 Sneider, Jeff (6 August 2015). "J.K. Rowling's 'Fantastic Beasts' Casts 'Brooklyn' Actress Jenn Murray (Exclusive)". TheWrap. Retrieved 7 August 2015. ↑ Ford, Rebecca (10 August 2016). "'Harry Potter' Spinoff 'Fantastic Beasts' Adds Zoe Kravitz (Exclusive)". The Hollywood Reporter. Retrieved 10 August 2016. ↑ "Fantastic Beasts and Where to Find Them: A worthy, magical addition to the Harry Potter universe - Firstpost". 20 November 2016. ↑ Nancy Tartagloine (12 September 2013). "Warner Bros, J.K. Rowling Team For New 'Harry Potter'-Inspired Film Series". Deadline Hollywood. Retrieved 12 September 2013. ↑ "'Harry Potter' producer David Heyman officially on board to produce 'Fantastic Beasts and Where To Find Them'". Page to Premiere. Retrieved 18 October 2013. ↑ Chitwood, Adam (25 May 2014). "Alfonso Cuaron Says He Will Not Direct Fantastic Beasts and Where to Find Them". The Daily Beast. Retrieved 25 May 2014. ↑ "X-Men's Jane Goldman Joining Fables Film Writing Team, Updates on Rowling's Fantastic Beasts". The Mary Sue. 20 January 2015. Retrieved 20 January 2015. ↑ "David Yates in Talks For 'Harry Potter' Spin-Off 'Fantastic Beasts'". deadline.com. ↑ "James Newton Howard to Score 'Fantastic Beasts and Where to Find Them'". Film Music Reporter. 7 April 2016. Retrieved 3 May 2016. ↑ Kroll, Justin (10 April 2015). "Eddie Redmayne the Frontrunner to Star in 'Harry Potter' Spinoff (Exclusive)". Variety. Retrieved 11 April 2015. ↑ Hawkes, Rebecca (25 March 2015). "Matt Smith cast in Harry Potter spin-off Fantastic Beasts?". The Daily Telegraph. Retrieved 25 May 2015. ↑ Withers, Laura; Kitchener, Shaun (26 January 2016). "Exclusive: 'I want to be in it' Michael Gambon begs for role in Harry Potter spinoff". Express.co.uk. Retrieved 9 November 2016. ↑ Dan Fogler [mrdanfogler] (16 August 2015). "#fantasticBeasts tomorrow the adventure really begins! my mustache is ready! are you?! so blessed!..." (Tweet). Retrieved 17 August 2015 – via Twitter. ↑ "Filming To Begin August 17th". FantasticBeastsMovies.com. 12 August 2015. Retrieved 17 August 2015. ↑ Steven Weintraub [colliderfrosty] (11 August 2015). "Fantastic Beasts and Where to Find Them starts filming in London on Monday. Heard most of the shoot is in London." (Tweet). Retrieved 17 August 2015 – via Twitter. ↑ Miles, Tina (20 October 2015). "Fake snow on Harry Potter prequelset as Liverpool filming makes progress". Liverpool Echo. Retrieved 21 October 2015. ↑ Kollewe, Julia (3 November 2016). "Harry Potter special effects firm looks east with sale to China group". The Guardian. ISSN 0261-3077. Retrieved 2 December 2016. ↑ "'Fantastic Beasts': James Newton Howard to score JK Rowling's 'Harry Potter' spin-off - NME". 9 April 2016. ↑ Szalai, Georg (7 October 2016). "Pottermore Debuts 'Fantastic Beasts' Theme Tune". The Hollywood Reporter. Retrieved 27 October 2016. ↑ Bacardi, Francesca (7 October 2016). "Fantastic Beasts and Where to Find Them Theme Song Includes a Nod to a Harry Potter Classic". E! News. Retrieved 22 November 2016. ↑ Derschowitz, Jessica (7 October 2016). "Fantastic Beasts and Where to Find Them theme debuts on Pottermore". Entertainment Weekly. Retrieved 27 October 2016. ↑ Kilday, Gregg (13 May 2014). "New J.K. Rowling Movie 'Fantastic Beasts and Where to Find Them' Gets Release Date". The Hollywood Reporter. Retrieved 13 May 2014. 1 2 3 4 5 6 Nancy Tartaglione (20 November 2016). "'Fantastic Beasts' Climbs To Magical $145.5M Overseas – Intl Box Office Update". Deadline.com. Retrieved 21 November 2016. 1 2 3 4 5 6 7 Nancy Tartaglione (27 November 2016). "'Fantastic Beasts' Climbs To $474M Global; 'Moana' Catches $16.3M Offshore Wave – Intl Box Office". Deadline.com. Retrieved 28 November 2016. ↑ Fantastic Beasts [FantasticBeasts] (10 December 2015). "Your first glimpse at #FantasticBeasts will arrive on December 15. pic.twitter.com/8Qi2QFfG7X" (Tweet). Retrieved 15 December 2015 – via Twitter. ↑ Fantastic Beasts [FantasticBeasts] (15 December 2015). "One hour until the #FantasticBeasts trailer. pic.twitter.com/nSgAxvUZmd" (Tweet). Retrieved 15 December 2015 – via Twitter. ↑ Fantastic Beasts [FantasticBeasts] (15 December 2015). "The Announcement Trailer for #FantasticBeasts is here. t.co/kVFBnSN3b7" (Tweet). Retrieved 15 December 2015 – via Twitter. ↑ Sullivan, Kevin P. "Fantastic Beasts and Where to Find Them trailer debuts at MTV Movie Awards". Entertainment Weekly. Retrieved 11 April 2016. ↑ Maloney, Jennifer. "The 'Fantastic Beasts and Where to Find Them' Screenplay to be Published as a Hardcover". The Wall Street Journal. Retrieved 26 April 2016. 1 2 Brooks Barnes (20 November 2016). "'Fantastic Beasts' Is a Hit for Warner Bros.". The New York Times. Retrieved 22 November 2016. ↑ Pamela McClintock and Rebecca Ford (17 November 2016). "Warner Bros.' 'Fantastic Beasts' Challenge: Luring 20-Something Potterphiles and Franchise Newcomers". The Hollywood Reporter. Retrieved 17 November 2016. 1 2 3 4 5 6 7 Nancy Tartaglione (17 November 2016). "'Fantastic Beasts' Unleashes $16.6M on Day 2 Overseas; $23.5M Running Cume". Deadline.com. Retrieved 18 November 2016. ↑ Joey Nolfi (17 November 2016). "Box office: Fantastic Beasts poised for magical opening weekend". Entertainment Weekly. Retrieved 18 November 2016. 1 2 3 Anthony D'Alessandro (19 November 2016). "'Fantastic Beasts' Gobbles Up Teen Girl, Vinny Paz & 'Billy Lynn'...But Is 'Potter' Spinoff Big Enough for a New Franchise?". Deadline.com. Retrieved 20 November 2016. ↑ "Worldwide Openings". Box Office Mojo. Retrieved 22 November 2016. 1 2 Charles Gant (22 November 2016). "Fantastic Beasts sprinkles magic dust over the UK box office". The Guardian. Retrieved 23 November 2016. ↑ Anthony D'Alessandro (27 October 2016). "Putting 'Fantastic Beasts' Opening Projections in Perspective". Deadline.com. Retrieved 31 October 2016. ↑ Brent Lang (27 October 2016). "Box Office: 'Fantastic Beasts and Where to Find Them' Eyes $75 Million Opening". Variety. Retrieved 31 October 2016. ↑ "Here's How Much Analysts Think 'Fantastic Beasts' Will Make Opening Weekend". Fortune. 8 November 2016. Retrieved 11 November 2016. ↑ Simon Thompson (12 November 2016). "Where 'Fantastic Beasts' Opening Weekend Will Fit in the Multi-Billion Dollar 'Harry Potter' World". Forbes. Retrieved 13 November 2016. ↑ Pamela McClintock (17 November 2016). "Box-Office Preview: 'Fantastic Beasts' Hopes to Make Magic With $70-80M U.S. Debut". The Hollywood Reporter. Retrieved 17 November 2016. ↑ Brad Brevet (17 November 2016). "'Fantastic Beasts' Eyes Fantastic Opening that Could Top $90 Million". Box Office Mojo. Retrieved 18 November 2016. ↑ Scott Mendelson (19 November 2016). "'Fantastic Beasts' Box Office: Not-So-Magical $29.7M Friday For J.K. Rowling Prequel". Forbes. Retrieved 19 November 2016. ↑ Scott Mendelson (18 November 2016). "Box Office: 'Fantastic Beasts' Finds Just $8.75M On Thursday". Forbes. Retrieved 19 November 2016. ↑ "Box Office Top 20: 'Fantastic Beasts' summons $74.4 million". Associated Press. 21 November 2016. Retrieved 22 November 2016. ↑ Anthony D'Alessandro (21 November 2016). "Will 'Moana' Slay 'Fantastic Beasts' Over The Thanksgiving Stretch?". Deadline.com. Retrieved 22 November 2016. ↑ Anthony D'Alessandro (22 November 2016). "'Fantastic Beasts' First Monday Beats 'Doctor Strange', & 'Harry Potter' 1 & 2". Deadline.com. Retrieved 23 November 2016. ↑ Scott Mendelson (22 November 2016). "Box Office: 'Fantastic Beasts' Finds Better Monday Than First Two 'Harry Potter' Movies". Forbes. Retrieved 23 November 2016. ↑ Scott Mendelson (23 November 2016). "Box Office: 'Fantastic Beasts' Finds $9.3M Tuesday, Better Than Five Prior 'Harry Potter' Films". Forbes. Retrieved 24 November 2016. ↑ Scott Mendelson (24 November 2016). "Wednesday Box Office: 'Moana' Scores Record $15.7M, 'Fantastic Beasts' Tops $100M". Forbes. Retrieved 24 November 2016. ↑ Scott Mendelson (26 November 2016). "Friday Box Office: 'Fantastic Beasts' Tops $355M Global, 'Doctor Strange' Passing $200M U.S.". Forbes. Retrieved 27 November 2016. ↑ D'Alessandro, Anthony (24 November 2016). "'Moana' Rings Up $81M+ & Ranks As 2nd Best Thanksgiving Debut After 'Frozen'". Deadline.com. Retrieved 27 November 2016. ↑ Nancy Tartaglione (13 November 2016). "'Doctor Strange' A Marvel As Pic Nears $500M WW, 'Billy Lynn' Walks With $13.2M; 'Arrival' Lands $10.2M – Intl Box Office". Deadline.com. Retrieved 14 November 2016. ↑ Anthony D'Alessandro and Nancy Tartaglione (15 November 2016). "'Fantastic Beasts' Box Office To Wolf Down As Much As $200M+ Worldwide: Weekend Preview". Deadline.com. Retrieved 16 November 2016. ↑ Scott Mendelson (17 November 2016). "'Fantastic Beasts' Box Office: J.K. Rowling Prequel Nets Promising $6.9M In Overseas Debut". Forbes. Retrieved 18 November 2016. ↑ Pamela McClintock and Rebecca Ford (18 November 2016). "Weekend Box Office: 'Fantastic Beasts' Heads for $75M-Plus Opening After $29.7M Friday". The Hollywood Reporter. Retrieved 20 November 2016. ↑ Sonia Kil (20 November 2016). "Korea Box Office: 'Fantastic Beasts' Dominates Opening Weekend". Variety. Retrieved 22 November 2016. ↑ Nancy Tartaglione (26 November 2016). "'Fantastic Beasts' Boasts $227M+ Through Friday; Bests All 'Potter' Bows In China – Intl Box Office Update". Deadline.com. Retrieved 27 November 2016. ↑ Patrick Frater (24 November 2016). "'Fantastic Beasts' Sees Powerful Chinese Opening Day". Variety. Retrieved 27 November 2016. ↑ Patrick Frater (28 November 2016). "China Box Office: 'Fantastic Beasts' Enjoys $40 Million Opening". Variety. Retrieved 28 November 2016. ↑ "Fantastic Beasts and Where to Find Them (2016)". Rotten Tomatoes. Retrieved 18 November 2016. ↑ "Fantastic Beasts and Where to Find Them reviews". Metacritic. Retrieved 18 November 2016. ↑ Peter Bradshaw (13 November 2016). "Fantastic Beasts and Where to Find Them review – JK Rowling goes steampunk". The Guardian. Retrieved 13 November 2016. ↑ Eric Kohn (13 November 2016). "'Fantastic Beasts and Where to Find Them' Review: The 'Harry Potter' Prequel Is One of the Best Blockbusters of the Year". IndieWire. Retrieved 13 November 2016. ↑ Ryan, Mike (12 November 2016). "'Fantastic Beasts And Where To Find Them' Is A Worthy, But Much Different, Successor to Harry Potter". Uproxx. Retrieved 12 November 2016. ↑ John DeFore (13 November 2016). "'Fantastic Beasts and Where to Find Them': Film Review". The Hollywood Reporter. Retrieved 13 November 2016. ↑ Vulpo, Mike (24 May 2016). "Teen Choice Awards 2016 Nominations Announced: See the "First Wave" of Potential Winners". E!. Archived from the original on 25 May 2016. Retrieved 25 May 2016. ↑ Sims, Andrew (15 October 2014). "WB names David Yates 'Fantastic Beasts' director". hypable.com. Retrieved 9 November 2016. ↑ Lieberman, David (15 October 2014). "Warner Bros' Kevin Tsujihara Outlines Major Film & TV Push Amid Cost Cuts: Time Warner Investor Day". Deadline. Archived from the original on 9 November 2016. Retrieved 9 November 2016. ↑ Barraclough, Leo (3 August 2016). "'Fantastic Beasts' Sequel in the Works With J.K. Rowling and David Yates, Release Date Set". Variety. Retrieved 9 November 2016. ↑ Bell, Amanda (1 July 2016). "Fantastic Beasts Movie Sequel Has Already Been Written". ScreenRant.com. Retrieved 9 November 2016. ↑ Khatchatourian, Maane; McNary, Dave (13 October 2016). "'Fantastic Beasts and Where to Find Them' to Be Five-Film Franchise". Variety. Retrieved 9 November 2016. ↑ McNary, Dave (1 November 2016). "Johnny Depp to Star in J.K. Rowling's 'Fantastic Beasts' Sequel". Variety. Retrieved 9 November 2016. ↑ Chitwood, Adam (8 November 2016). "'Fantastic Beasts 2': Johnny Depp Confirmed as Grindelwald; Setting Revealed". Collider.com. Retrieved 9 November 2016. ↑ Wood, Matt (19 November 2016). "Fantastic Beasts and Where to Find Them 2 takes place in Paris". Cinema Blend. Retrieved 19 November 2016.